Wedding, Family Holiday and Honeymoon in One! We chose the Aliathon Village in Cyprus as both an excuse for a family holiday and oh yeah that small matter of getting married!! The wedding package was very reasonable and we sat back and relaxed whilst everything was arranged for us, meaning a stress free, intimate, sunny and reasonably priced Wedding. For us, this provided exactly what we wanted - a low-key, yet exceptionally special day with just close family in the glorious sunshine. Everything was arranged perfectly, including transport to the registry office, paperwork, hair, make-up and photographer, all we needed to do was to show up! I would not suggest getting married this way if you were the little girl/boy who always dreamed of a big white wedding with horse, cart and fireworks, or if you want to plan your big day with full control over every detail yourself. But if like me, you don't want to stress over the arrangements and critically haven't the money for a huge affair this is just perfect. It also provided the perfect excuse for a well overdue family holiday and honeymoon in one and certainly if you have young Children it does not disappoint. The facilities are fantastic, swimming pools, fun pools, kids clubs, night time entertainment all encased in a wonderful country to go out in and explore. Car hire is incredibly easy to do and is located just next to the resort. We took off many times and it is just stunning, although I would strongly suggest not to say "Hey lets have a look down this little road and see where it leads".....or you may just find yourself having a heart attack driving at the edge of a mountain on a narrow road - as I did! We visited Aphrodite rock - a humble and as yet refreshingly un commercialised attraction which is not a long drive from the Resort. The all-inclusive package was just fantastic. The food was delicious and offered a vast variety. Not once was I disappointed with the choices and really enjoyed all my meals. Situated in the middle of the main pool there was also a small food hall, serving burgers, chips, hot dogs and salads during the day (also part of the inclusive deal) This was great for a quick snack when the main restaurant was closed. Also next to the small food hall was a ice-cream and cold drink stand - which my Children were particularly impressed with and were often slipping off for a sneaky ice-cream on their own! My eldest really enjoyed the kids club, although book early to avoid disappointment as numbers are limited. The splash pool was great fun too for both children and adults alike. The staff were all very friendly and helpful and always rectified any issues very promptly. The evening entertainment was what you would expect from these types of resorts, we generally avoided it and opted for a quiet drink on our terrace in the evening, but it seemed popular with most of the guests at the resort. All in all I would highly recommend this resort, especially if you have young children. Lively, fun and plenty to do, exactly what we wanted. In fact our experience has influenced our holiday this year which has been booked in the Holiday Village in Turkey, fingers crossed it will not disappoint! This hotel is only about 20 to 30 mins away from the airport and was the first drop off on arrival and the last pick up on departure. Checking in was easy because you were given your room key on the bus and had to fill in a form and hand it in to reception on arrival. The quickest and easiest check in we have ever had. When we booked this holiday the only room we could get was a studio room as everything else had sold out. We took this with the intention of upgrading once we got to the hotel. I have to say that the room was a disappointment; it was tiny with only a wardrobe for clothes. There were no drawers or shelves to put your clothes in so we had stuff out everywhere. I went straight to reception to see about upgrading to a bigger room but the hotel was fully booked. They said they would be in touch when a bigger room became available, I also contacted the First Choice rep and they looked into it for us as well. They kept us informed on what was happening and were really helpful. On the second day we were told that we would be getting a one bedroom apartment the following day that would cost us 15 euros per night. The changeover went as smoothly as everything else at this hotel and we were very happy with our apartment once we were moved. Well worth the extra money and cheaper than what First Choice would have charged us. There was plenty of storage areas in the apartment and plenty of room to relax in. All rooms have air conditioning which was definitely needed and appreciated after a long day in the Cypriot heat. Both the rooms we had were in the older Aegean part of the complex. This area is not as modern or as pretty as the newer Fishing Village but it was still really nice and spotlessly clean and landscaped. All rooms have a balcony area and they are well set out. The Aegean area was also quieter than the main area by the Fishing Village. The rooms were clean and comfortable. The towels were changed every day except Sunday, bedding was changed 3 times during the 2 weeks we were there and rubbish was taken away every day. The only complaint I would have is that the floors were not swept or washed during our stay and after 2 weeks they were quite mucky with dust etc. There is a kitchen area in all the rooms/apartments that have all the facilities you would need if you were self-catering. It was handy having a fridge and kettle. The safe costs 3 euros per day. The food served in the main restaurant was your usual buffet fayre. It was always hot and there was always something for everyone and plenty of it. At breakfast there was the choice of cereals, cooked breakfast items, pancakes, fruit, meats, cheeses, bread and cakes. Lunch always had salad, fish, chicken, vegetarian, fruit and the same for supper but with a larger selection and always had a roast being carved. There was also a dedicated children’s area with their own little buffet menu. We could not fault the food. Wine, lager, soft drinks, water, tea, coffee and fruit juices were always available. All poolside bars served ice cream and snacks. The snacks at the main pool in the Fishing Village were served buffet style, you just went in and helped yourself. This was really good and there never seemed to be any queues forming. There is also a Greek Restaurant and a Mexican Restaurant and you are given vouchers to eat at these once per week during your stay. We weren't really impressed with these restaurants and didn't bother using our vouchers during the second week. This hotel does Cypriot weddings on a weekend so the main restaurant tends to do themed nights on the Saturday which was Greek both Saturdays that we were there and a bbq on the Sunday night at the Greek Restaurant. The chefs are obviously employed to do the Cypriot wedding meals but it doesn't interfere with your holiday. The hotel is part of the Aliathon Plaza and has many restaurants and bars adjacent to it on the main street. In your welcome pack you get a card that gives you 10% off drinks in these bars and 15% off meals in the restaurants. There is also a mini supermarket but the staff in here were a right miserable bunch. This really surprised me because everywhere else the Cypriots were lovely and friendly. This hotel does lots of British weddings and it was quite usual to be walking to the pool in your swimming gear and for a bride and her bridesmaids to go sweeping past you. Or to be at the entertainment at night and for there to be a couple of brides doing the 'choco latte'. Because of the weddings there did tend to be quite large extended family groups at this hotel but the hotel was large enough for this not to be a problem. The pools are stunning. There is the main pool which gently shelves like a beach with an adult only part which is completely separate. There is a splash zone and 2 lovely pools in the Aegean Village too. You get a voucher in your welcome pack that entitles you to free pool towels and these can be changed regularly throughout the day. We found that there was always plenty of sunbeds and the entertainment by the pool was very amusing. The In2action guys were brilliant and always had something on the go but they did not pressure you into doing things if you didn't want to. The kids clubs were brilliant and we hardly saw my daughter, she made lots of friends and thoroughly enjoyed her holiday. The entertainment was poor. The resident entertainers tried their best but they were awful. The night started off with the usual kids disco and then they would have bingo and then onto the evening entertainment. The hotel did bring in outside acts about 3 times a week. There is a separate bar next to the entertainment area which showed all the football on big screen TVs and they did have singers/karaoke/comedian on after 11pm but we were always too tired by then so never actually saw any of that. We did tend to spend most of our evenings in this bar because the entertainment was so poor. The all-inclusive drinks were many and varied and included a limited amount of cocktails. When the bar was busy they did not serve children or children’s drinks to adults because it was predominantly an adult area. Kids would be directed to the main entertainment bar during these times. This is our third Holiday Village but it is the first one we have been to that had separate adult only areas and bars. There was plenty of space to get away from the whole 'family' thing if you wanted to. This hotel is not exclusive to First Choice and there were other nationalities staying there which just added to the holiday atmosphere. 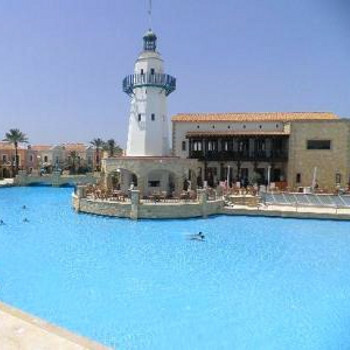 The hotel is on the edge of Paphos and has several other hotels across from it. The beach is also across the road in front of these hotels. You can walk into Paphos to the old harbour area and that takes about half an hour and is a pleasant walk either along the beach front or along the main thorough fayre. Buses run regularly and only cost 1 euro per person. Taxis were plentiful and fairly cheap. We really enjoyed our holiday at the Aliathon and would definitely go back in the future. The place is amazing. It is very relaxed and completely stress free. They just do everything right at this hotel. Some of the other Holiday Villages could take lessons from the Aliathon. We never had to queue for anything despite the hotel being fully booked the whole time we were there and there was always a seat in the bar. Would definitely recommend this hotel to families and couples alike. Bright, Clean & Welcoming and Great for Cat Lovers! We opted for the Deluxe one Bedroom Apartment. Although not huge we were very satisfied with our accommodation. Bright and clean with ample amenities for our requirements. We had a small kitchen adjoined to the living room area with a kettle, fridge, hob and microwave. This was all we needed as cooking wasn't necessary thanks to the all-inclusive package - where food was provided in the main restaurant. We had a small lounge with TV, small table, chairs and sofa. Bedroom, again small, but wardrobe space and dressing table was provided. Our little terraced outside area was where we spent most our time, soaking up the atmosphere and sunshine. The resort has attracted many stray cats who will visit you hoping for the odd morsel or two. We temporarily adopted a pair of cats who would visit us each night and be delighted with any nibbles we could provide. My parents had the Junior Suite (So my children could stay with them so hubby and I could enjoy some long overdue 'us time') although similar to ours, it had an extra room for the kids which included a PlayStation 2. I would definitely recommend the Junior Suite if you have children, although the Deluxe 1 Bed Apartment was able to accommodate children, it would have been at a struggle - They would have had to sleep on Z-Beds in the lounge, leaving only the bedroom area for the adults to stay up in! All in all, small, but everything you need and the Resort offers so much to do, our accommodation was only a quick stop gap and place to grab some sleep in between all the fun anyway! Just came back from a 2 week stay at the Aliathon. Fantastic. We were in a 1 bed apt. in the old part of the village and it was bright, spacious and very clean. Quieter at that end, which we liked, but could also see that children were well catered for in the FV and splash pools. The staff were so friendly, especially Marina at the lagoon pool. No matter what time of the day, cleaners were always about and the place was spotless. Can't make any complaints about the food with the AI. There was plenty of choice, salads, pastas, hot dishes, fruit, etc.. Drinks were ok. Soft drinks during the day and then Keo at night. We didn't go in for the entertainment, but it was always busy and everyone looked like they were having great fun. We had our wedding at the hotel and it was the best day ever. Staff were so nice to us and on our last night we had a candle lit dinner in the Greek restaurant, which was wonderful. Would love to go back. 2nd time at the Holiday Village. Food - sometimes could have been warmer and dress sense of some of the adults in the evening is shocking - people wearing vest tops and shorts, someone should be managing this and implement a dress code. Air con at lunch time was a problem though, it appeared to be turned off! Finally - if you were there you will have seen the carry on with fixing the pool in the Fishing Village - what a carry on and for the management to allow the painting of the pool when people were sitting close by was a disgrace - the fumes were so strong that they had to finally close off a section of the 'beach' area. Just as well a holiday maker was an expert in the process that they should have been following or we may all have suffered from the toxic fumes being used! The hotel and surrounds are very clean, the staff all friendly including cleaning staff second visit to this hotel and have stayed in both old and new and have done both AI and self catering. There was a good variety of food on offer if not a little bit bland and unadventurous, the breakfasts were vast with fresh pancakes and french toast as well as traditional English and continental. Always lots of salad avaialable and a good variety of veg. The drinks were local imitations but perfectly fine, I did however stay away from the wine. The meal in a greek resturant was lovely with huge portions, the mexican however was a waste of time a let down for the hotel. The restuarants that are slightly further away from the hotel towards the harbour were very nice and not expensive you just had to walk 10 mins or so to get to them. The kids all enjoyed the kids clubs, but they put all the 3 - 8 agegroup in together which is a bit boring for the two 8 year olds we have. My 10 year old went to wavelength and had a great time and made lots of friends, he also joined in with the numurous activities put on each day by the pool including raft building, archery and many others. We didn't send the baby to the creche so can't comment on that. He was very happy in the great splash park. This years entertainment team were very good, the kids discos were fun but too many games that dragged on and not enough dancing we didn't stay after the disco so not sure what variety of entertainment there was. Rooms are spacious and clean, but you have to pay 2 Euros per day to use the safe & another 2 Euros per day for the iron. The one bedroom has twin beds which refuse to stay pushed together on the tiled floor. Our 2 kids slept in the lounge on the settee with a separate pull out bed. Our 16 year old daughter said the settee was not very comfortable for sleeping and she is unhappy with the lack of privacy. When we booked in May we were told all the 2 bedroom apartments were fully booked, but were then surprised to find some guests had received a free upgrade to a 2-bedroom apartment. Wardrobe and drawer space is insufficent for 4 people but would be okay for 2. The real disappointment is the food & we spoke to dozens of other guests that agreed. The choice of food is very limited and repetitive with the same dishes being served night after night. We complained that the soup was cold only to be told that it is meant to be served cold. A number of guests likened the meals to school dinners. The Mexican "restaurant" is just a petitioned off area of the main buffet restaurant and the Greek "restaurant" is the pool snack bar. There are 6 proper restaurants at the front of the complex (Greek, Mediterranean, Chinese, Mexican, Indian & Italian) and a proper English pub where the food is much better but we found these to be very expensive. Even with the 10% discount given to all-inclusive guests a 3 course evening meal cost around 90 to 100 Euros.